This past weekend, Fan Expo Vancouver 2017 assembled the cast of the CW’s The Flash and that includes a very rare Con appearance (outside of San Diego Comic Con) for series star Grant Gustin. 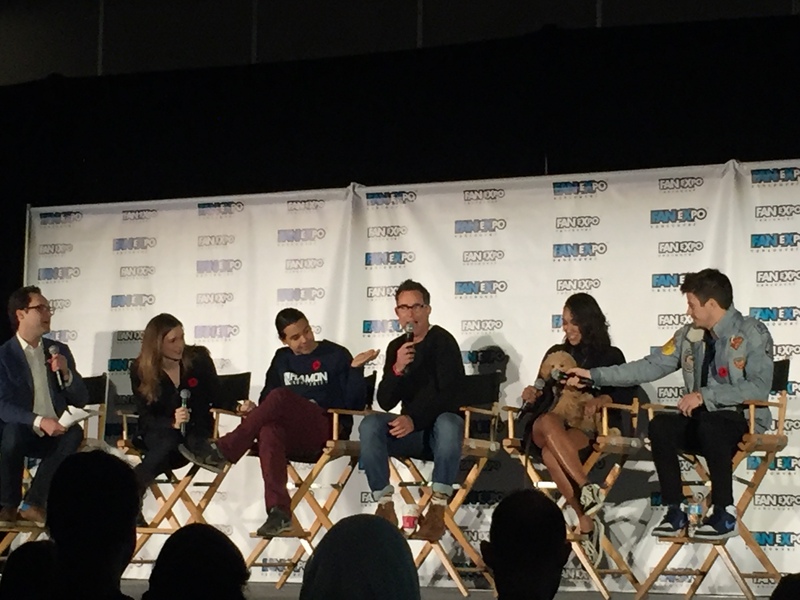 Throughout the 45 minute panel, you could see the chemistry between the cast as Gustin, Candice Patton, Carlos Valdes, Tom Cavanagh and Danielle Panabaker all riffed and ribbed each other. Examples include Valdes saying how his character is beloved and it translates off screen “Danielle would do anything for me,” he said. During the panel, Tom Cavanagh previewed this week’s episode (“When Harry Met Harry…” that features the Council of Wells. “It is shameless having one guy playing five to six different characters with one worse than the other,” Cavanagh said. “I am wasting screen time just for myself.” While Panabaker is excited to see the Council of Wells, Valdes joked (or was he?) that he had to wait a long time between takes as Cavanagh changed into the different Wells. As for the favourite version of Wells Cavanagh got to play? He answered it was the Reverse Flash because he got wear a super suit. Other highlights of the panel included Valdes wearing a Ramon Industries sweatshirt. And Gustin sported a jean jacket that had various patches on it like the Superman logo and one for the hair gel product he uses. Valdes also talked about working with Danny Trejo and joked that he is a “scary old man”. But on the serious side, Valdes told the crowd that Trejo was the sweetest man and his life was insane and filming the episode was exciting. On the upcoming 4-way cross-over, Gustin said they just finished filming it (it is the 8th episode of the season) and logistically it was challenging to film because not one of the 4 shows shut down their own productions to film the cross-overs. As for another musical episode, Gustin said they will do another one but not this year. Gustin felt that not everyone was utilized citing Cavanagh as an example. When Cavanagh also pointed out Patton, she made a face at the possibility of singing. The panel was thin on previewing what else is in store in upcoming episodes but Cavanagh did plug the short film he did with Gustin called Tom and Grant. Gustin also thinks he would be funny if they did a Flash spoof for Funny or Die that starred the cast. On the chemistry between West-Allan, Patton said it is easy and that Gustin knew Patton was Iris at the auditions. When it comes to filming in Vancouver, Patton loves that the city has embraced all of the different productions, including theirs. Gustin quipped that he probably “laid on every single street in Vancouver.” He also added that he understands the frustration that people feel at parts of the city being shut down for filming as he experienced it himself. Gustin shared how his building was shut down for the filming of the Fifty Shades of Grey sequels and had some of his windows blacked out. Valdes also shared that he was mortified to see his season 1 performance and likes to see he has gotten more comfortable over time. Also, Valdes said he didn’t know he could be funny as before he was doing more dramatic work. “It threw me for a loop to be so comedic.” Valdes also credits his comedic timing to Cavanagh calling him the genius and him the plugger. And if fans were confused by all the sci-fi elements of the show, don’t worry the cast is too. Gustin tells the crowd that he had a hard time explaining Savitar. On Team Flash, “We care about each other and have each other’s backs. You can’t fake that and it comes across the screen,” said Gustin. A question came up on anything that has surprised them over the course of the show. Panabaker said she was surprised to learn Caitlin’s dad was dead and Valdes said was the Zoom reveal and how Team Flash trusted another villain. As the panel started to wrap up, the cast discussed being part of The Flash, Gustin likes to see where his character will turn up even though he can’t control what is in store, Patton is thrilled to be playing an iconic character as a black actor. Cavanagh likes to invent different people, Valdes loves learning from the cast and Panabaker says it is the cast. The cast left the fans in attendance with some parting thoughts.